If you want to build competency models and include competencies in your HR applications, you will need to choose a method to use in building the models. Whatever method you choose, it will be much easier and faster if you can draw on a list of specific competencies to include in each model. These lists are also known as competency dictionaries. Last year, this post “Build or Buy a Competency Dictionary?” compared competency dictionaries and detailed options for acquiring a competency dictionary that can be used for developing a competency “framework”, competency models, and applications for talent management. Three options, including advantages and disadvantages for each, were described. 3) Purchase the Workitect competency dictionary. 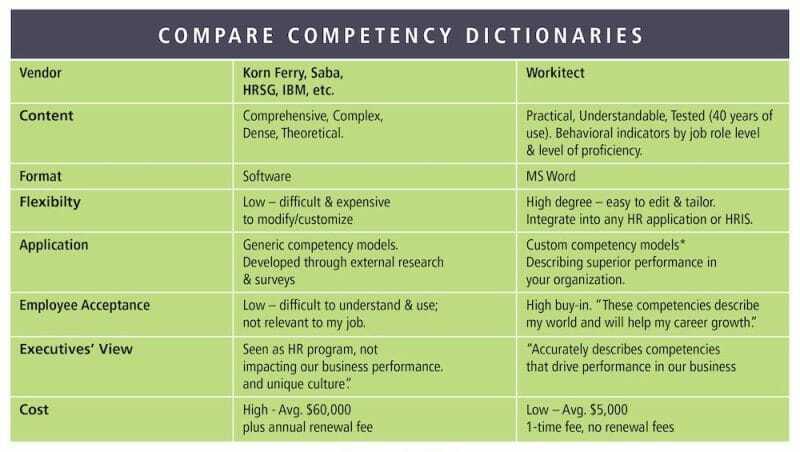 In this post, a comparison between Workitect’s customizable dictionary/library and those available from other consulting firms is captured in the chart above. M- Low – difficult & expensive to modify/customize. W- High degree – easy to edit & tailor. Integrate into any HR application or HRIS. Build Generic or Custom Competency Models? M- Generic competency models. Developed through external research& surveys. W- Custom competency models*. Describing superior performance in your organization. Employee Acceptance – Are the Competencies Simple & Practical? M- Low – difficult to understand & use; “not relevant to my job”. W- High buy-in. “These competencies describe my world and will help my career growth”. Executives’ View – Is the Focus on Business Outcomes? M- Seen as HR program, not impacting our business performance. W- “Accurately describes competencies that drive performance in our business and unique culture”. *Based on the job competence assessment methodology developed in the 1970s by Dr. David McClelland and consultants at McBer & Company. These organizations are a few of the users of the Workitect Dictionary, Competency Interview Guides, or Competency Development Guide. These materials are also available as an integrated “bundle” with a focus on improving an organization’s ability to attract, develop, and retain talent. Instructional programs on how use the dictionary to build models. Consulting to build competency models for you or with you. Workitect is the leading developer of job competency models and competency-based human resource applications, tools, and programs.